QUITO, Ecuador (AP) — Leftist candidate Lenin Moreno appeared to have won Ecuador’s presidential election but his opposition rival refused to recognize the results, calling on his supporters to take to the streets to guard against fraud. Sunday’s second-round runoff in the Andean nation of 16 million was being watched closely as a barometer of whether the left, which had dominated South American politics for the past 15 years, could stop a string of right-wing victories across the region. With almost 99 percent of polling places counted, Moreno had 51 percent of the vote while conservative banker Guillermo Lasso stood at just under 49 percent â a difference of about 230,000 votes. 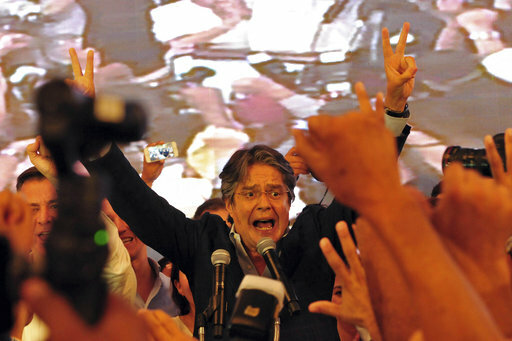 Lasso said he would challenge the results in all of Ecuador’s 24 provinces after three exit polls showed him winning. He also questioned why results, which took three days to calculate following the first round of voting in February, were announced so quickly in Sunday’s runoff. “This is very sickening. We’re not going to allow it,” Lasso told supporters, adding that he had shared his concerns with the head of the Organization of American States in a phone conversation. He accused President Rafael Correa of trying to install an illegitimate government and called on his supporters to protest peacefully but firmly. Thousands of outraged Lasso supporters shouting “fraud” crashed through metal barricades to almost reach the entrance of the electoral council’s headquarters in Quito. Some stayed late into the night, but by morning the crowd had thinned to less than a dozen die-hard supporters. In Guayaquil, where Lasso is from, supporters shouted “Get out Correa!” and threw sticks at a formation of riot police before being pushed back with tear gas. There were reports of small scuffles and clashes in other cities but no major disturbances overnight, and Moreno early Monday thanked Latin American presidents who called to offer congratulations. Correa accused Lasso supporters of trying to deny the results and provoke violence, while the head of the electoral council, a favorite punching bag of the opposition, appealed for calm. “Ecuador deserves that its political actors show ethical responsibility in recognizing the democratic will expressed by the people at the voting booths,” National Electoral President Juan Pablo Pozo said while announcing results. The only evidence of possible fraud presented by Lasso’s campaign is result at a tiny provincial voting center that it said was reversed when reported to electoral authorities in Quito. There was no immediate comment from the OAS, which sent a mission of electoral observers. Outside the region, the election was being closely watched by supporters of WikiLeaks founder Julian Assange, who has been living under asylum at Ecuador’s embassy in London since 2012. Before the election, Lasso had said he would evict the Australian activist, who is wanted for extradition by Sweden, within 30 days of taking office. Moreno said he would allow him to stay. On his Twitter account shortly after the results became known, Assange took a jab at Lasso’s pledge. “I cordially invite Lasso to leave Ecuador within 30 days (with or without his tax haven millions),” he wrote. Three exit polls had shown Lasso winning, including one that accurately predicted the first-round results and gave him a 6-percentage point victory. A quick count of voting acts by a respected local watchdog found there was a technical tie, with a difference of less than 0.6 percentage points separating the two candidates. The group refrained from saying which candidate had the advantage. “The moral fraud of the right-wing won’t go unpunished,” he wrote on Twitter. With Ecuador’s economy slated to shrink by 2.7 percent this year as oil prices remain low, analysts had been anticipating that Lasso would rally support from the 60 percent of voters who backed anti-Correa candidates in the first round and join the growing list of Latin American nations â Argentina, Brazil, Peru and Venezuela â shifting to the right in recent elections. The majority of voters also said they were hungry for change amid ongoing corruption allegations related to bribes that Brazilian construction giant Odebrecht paid to officials in Correa’s government and a $12 million contracting scandal at state-run PetroEcuador.